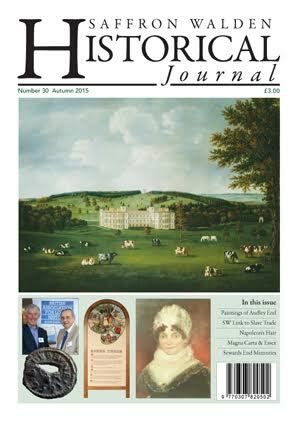 The Autumn 2015 edition of the Journal included articles featuring: a fascinating study of the paintings of William Tomkins of Audley End; a look at the six Essex barons who were among the 25 involved in Magna Carta; some insights into a remarkable set of solicitors’ deeds; a local connection to the slave trade; a link between the town and Napoleon Bonaparte; memories of Sewards End – and more. Issue no 29 of the Journal features unusual view of Saffron Walden High Street, designed by Nick Crawley, cleverly blending a view from the top of the High Street in 1820 with the same view today. Articles included an archaeology dig discovering human remains at the Tudor Works site; a WW1 story about the treatment meted out to a member of the Friends’ Meeting House, High Street, Cornelius Barritt who was victimised as a conscientious objector; a nostalgic wander by Bruce Munro down the High Street early 1950s; the life of one of its residents, Dr Hedley Bartlett, whose medical practice was in the High Street; the history of the oldest retail business in the street, Gray Palmer who kindly sponsored this issue of the journal. Articles on local villages include a pioneering study of how pastoral landscape evolved in Anglo Saxon times; an analysis of the undertakers’ records in Sampfords; an archaeology find in Wicken Bonhunt; and a look at a curious building in the grounds of Elm Grove. 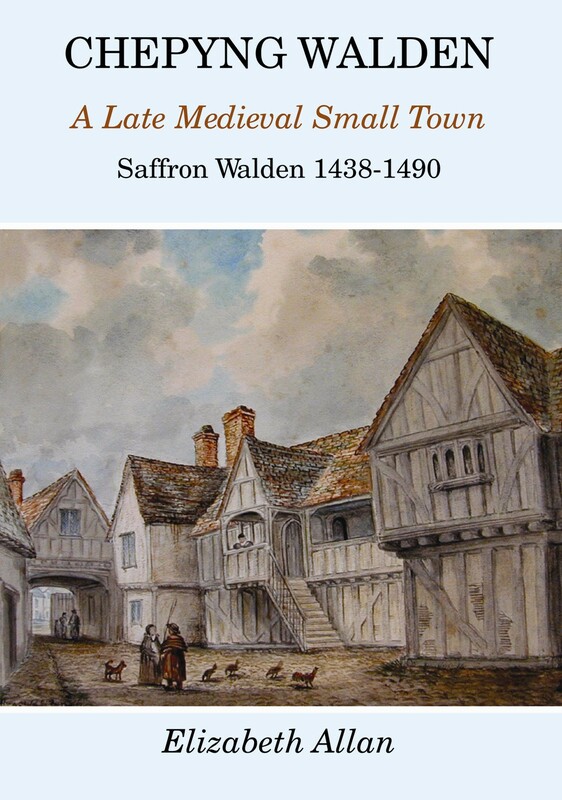 The major new publication by the Society, a history of Walden in the 15th century, is reviewed along with other new local history books. This entry was posted in Uncategorized on May 2, 2015 by saffronwaldenhistoricalsociety. The beautiful gold Saxon Ring acquired by Saffron Walden Museum, found in the fields of NW Essex, is featured with a splendid colour photograph on the front cover of the Saffron Walden Historical Journal, No 28. Another specially-commissioned article is by Christopher South, the BBC Radio Cambridgeshire broadcaster, recalling his memories of 1950s Walden. Christopher was a junior reporter on the Saffron Walden Weekly News at that time and writes fondly, and often hilariously, of the personalities he encountered and the atmosphere of the town half a century ago. 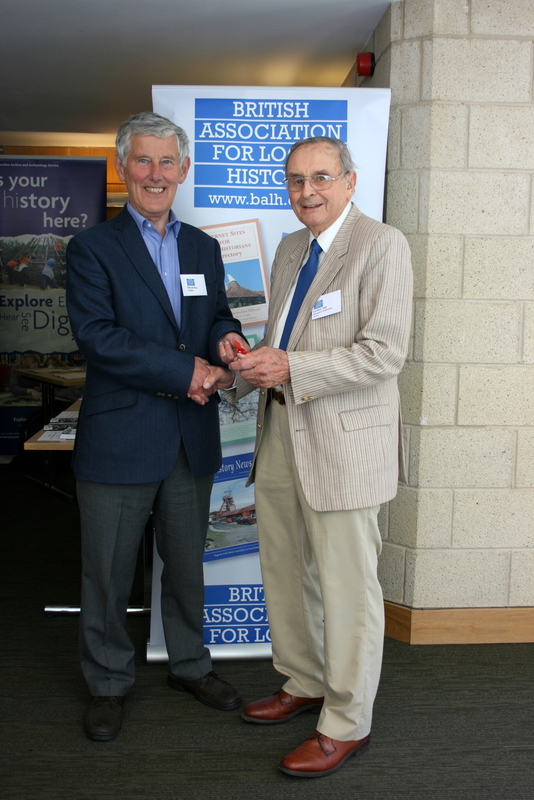 Another article that will bring back fond memories is Geoffrey Ball’s research on the story of Blyth & Pawsey, the firm of agricultural engineers who once were a big employer in the town. The recent closure of the Methodist Church in Castle Street, has prompted a look at the history of this church which now no longer has any chapels left in NW Essex, its members having joined other churches. Littlebury author Lizzie Sanders contributes the last of her articles on the hamlets of Audley End, using little-known old maps to recreate the history of North End, just outside the town but once within its boundaries. There is also an article about Samuel Pepys and his connection to the town, the Charter Weekend held in Saffron Walden, WW1 centenary events, the story of a Quaker who travelled to America in the 18th century, a study of an unusual house in West Road, Saffron Walden and the memories of the Head Woodman on the Audley End Estate. This entry was posted in Journals post-2001 on October 26, 2014 by saffronwaldenhistoricalsociety. 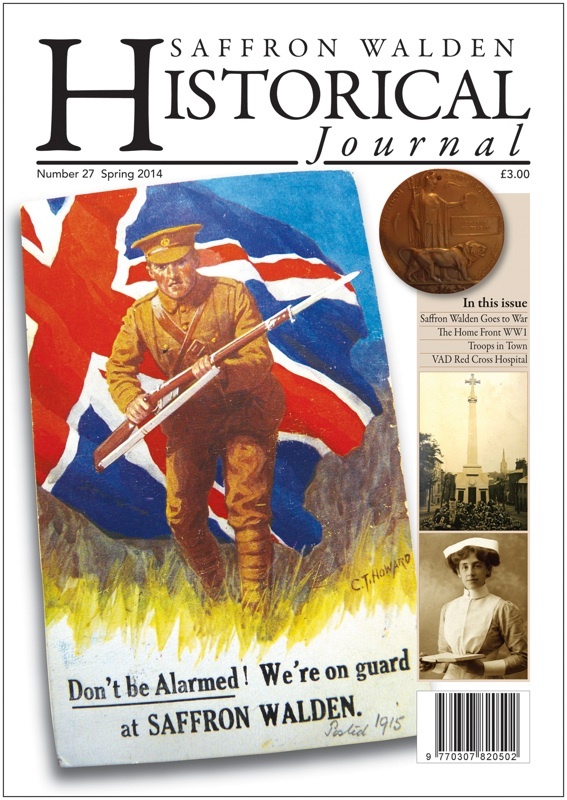 The wide-ranging impact of the First World War on life in Saffron Walden is the theme of the Spring 2014 issue of the Saffron Walden Historical Journal, a bumper issue of 40 pages which was published on 28 April 2014. More than dozen specially-commissioned articles are complemented by about 70 illustrations, including many never published before, and numerous photos of the men of Walden who fought in the war, 159 of whom did not return. Photos of some of these men, recently found in a cupboard, are published for the first time. Starting with one man’s personal account of soldiering right through the war, the journal continues with an in-depth and very perceptive analysis by John Howard of the reasons behind the extraordinary anti-German riot which took place in the town soon after the outbreak of war. The immense efforts needed on the Home Front are the subject of other articles by Jacqueline Cooper. As the war developed, military tribunals were introduced with increasing numbers applying for exemption. The conduct of these tribunals and the experiences of conscientious objectors are examined by town historians, Malcolm White and Martyn Everett. Local residents have loaned some remarkable postcards which reflect what must have been the most noticeable effect of WW1 on the streets of the town – the billeting of thousands of troops in 1915 and other times. This affected the economy of the town and impacted on children’s education. 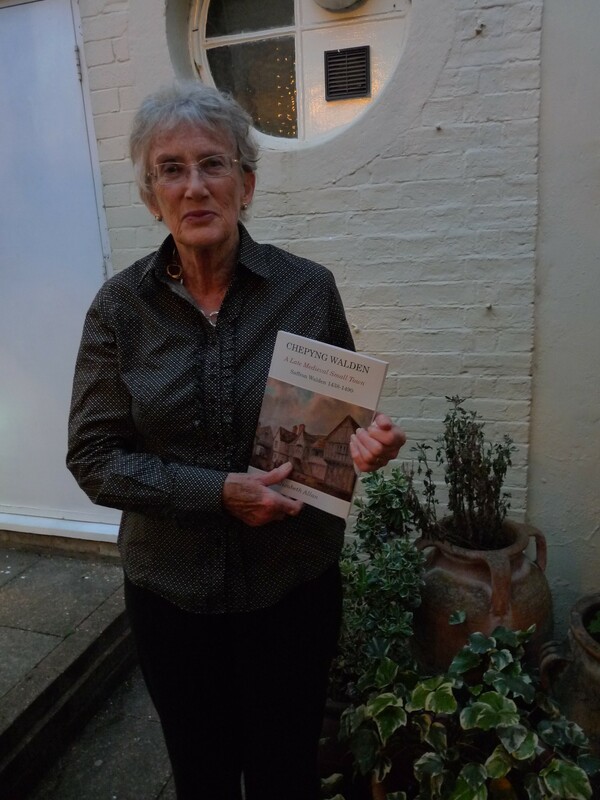 Saffron Walden’s expert on WW1, Robert Pike, has contributed a number of articles, while the role played by women in the war is exemplified in Deborah Lowe’s detailed biography of one remarkable nurse. This issue also has a new look. The journal team has sadly lost the services of former deputy editor, Gordon Ridgewell who has moved out of town: ‘We would like to pay tribute to Gordon’s work,’ commented editor Jacqueline Cooper. ‘He has given his expertise, energy and enthusiasm over the past ten years through more than 20 issues, and helped to make the journal an important part of the town’s history scene.’ Martyn Everett has now become deputy editor, with the graphic design now in the hands of Nick Crawley, who has redesigned the journal. This entry was posted in Journals post-2001 on April 28, 2014 by saffronwaldenhistoricalsociety.